HomeWhat are National Standards worth when our 10-year-olds are the worst in the world at multiplication? 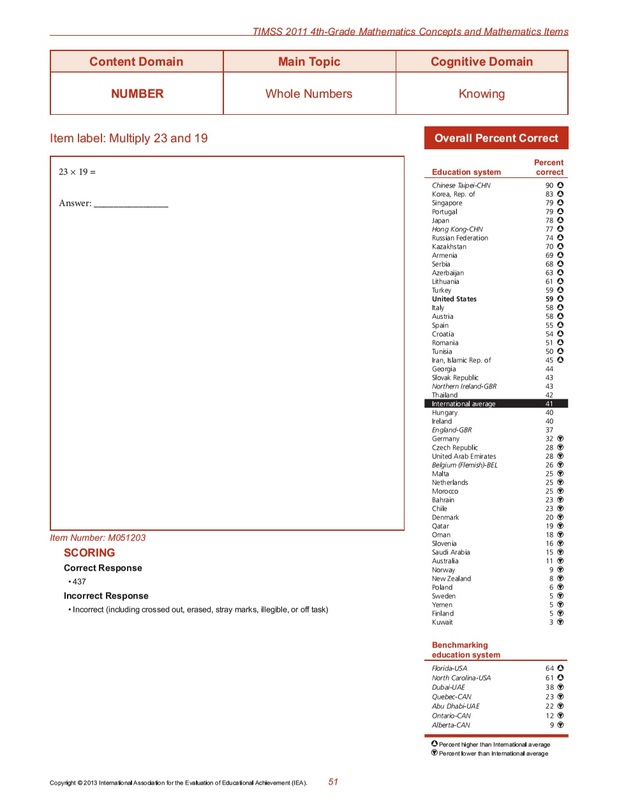 What are National Standards worth when our 10-year-olds are the worst in the world at multiplication? Teachers and parents would naturally think that if a child is at or above the National Standard in Mathematics, then that child must be doing okay. 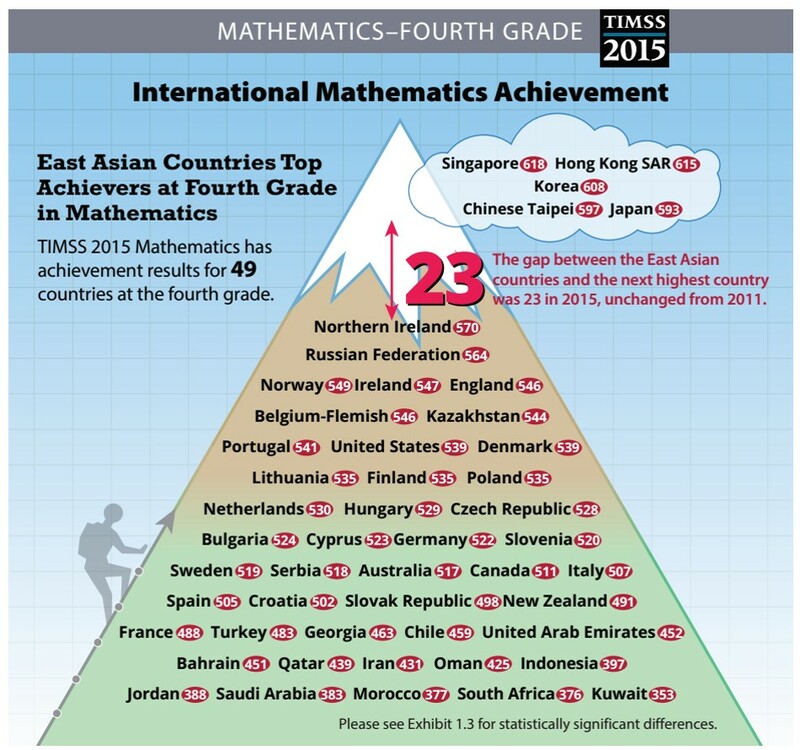 Results from the international Trends in Mathematics and Science Survey (TIMSS) tell us something quite different. At the end of 2014, a representative sample of 6,321 New Zealand Year 5 students with an average age of 10.0 years were surveyed. 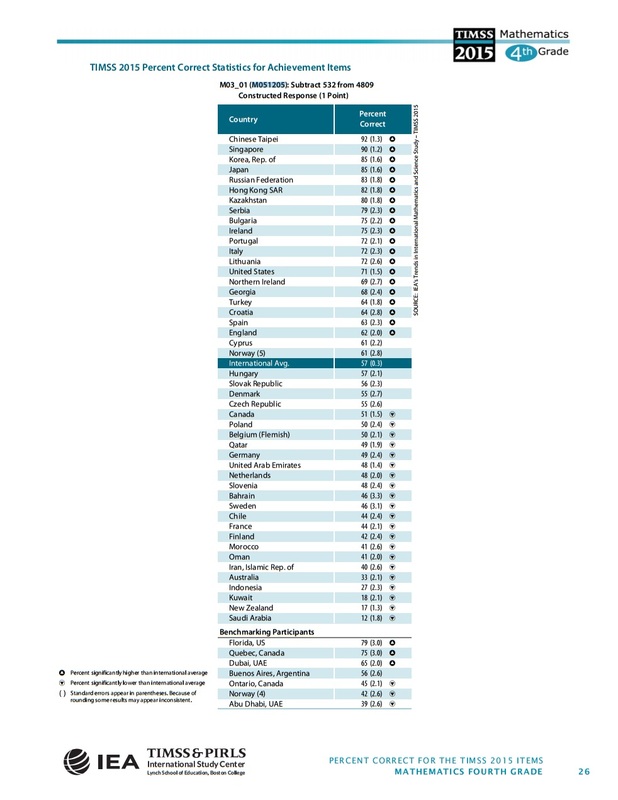 Out of 49 countries, New Zealand placed 34th, behind all other participating predominantly English-speaking countries. Radio New Zealand put it a little more bluntly. To be fair, some of the questions were considered too advanced for a New Zealand Year 5 student. However, when restricted to the questions deemed appropriate against the New Zealand Year 5 National Standards, the average student answered fewer than half of those questions correctly. And yet, the National Standards data for 2014 tells us that 73.2% of New Zealand Year 5 students were at or above the National Standard. If we match this up with the TIMSS international benchmarks, it suggests that some of these students who were at or above the National Standard would probably have been classified as Low achievers in TIMSS. 16% of our 10-year-old TIMSS participants were Below Low. These students completed fewer than half of the Low benchmark tasks correctly. This is a significant proportion compared to other countries, e.g. England (4%), the United States (5%), Australia (9%). In the top performing countries, less than 1% of their 10-year-olds are Below Low. More concerning are the statistically significant increases in the large proportions of Māori (26%) and Pasifika (31%) students who were Below Low. If we are going to address the inequality in this country, providing these students with a maths education leading to greater opportunities would be a very good place to start. To add to the humiliation of coming last, 27 x 43 was a multiple choice question with four options. New Zealand’s result is worse than what we would expect from random guessing (25%). The previous cycle of TIMSS suggests a constructed response success rate would have been lower. Our current maths curriculum has made our children so bad at basic arithmetic that they’d be better off guessing. Is this a standard to be proud of? One might claim that it doesn’t matter – maths is not about the numbers, after all. TIMSS dispels that myth. There was a very strong positive correlation between country performance in Number versus both Geometric Shapes and Measures, and Data Display. There was also a very strong positive correlation between country performance in Knowledge versus both Applying and Reasoning. Suffice to say, number knowledge is a very strong predictor of success in all areas of mathematics. Taxpayers should consider how much money has been spent on primary maths education since 2000 and question a further $126m being spent over four years on more of the same, without addressing the obvious weak spot in the curriculum. I spoke to Radio NZ about it. The cost of rolling out the Numeracy Project amounted to around $70m in the first seven years. That’s about $85m in today’s money. The goal of the Numeracy Project “was to improve student performance in mathematics through improving the professional capability of teachers”. It failed. In 2015, the Minister of Education at the time said that around $70m a year was available for professional development, and that was before she promised further money for maths professional development in response to the New Zealand Initiative’s Unaccountable report. 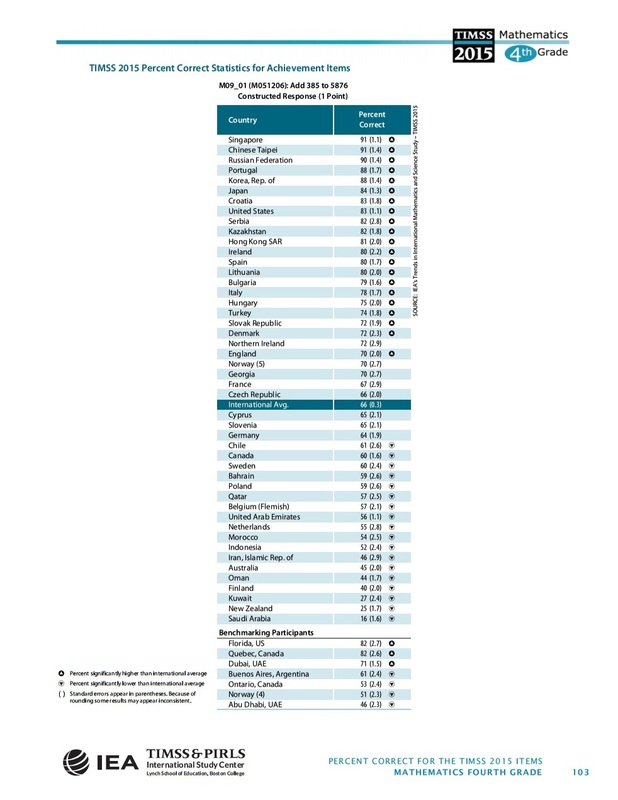 TIMSS informs us that New Zealand has higher proportions of teachers who participate in maths professional development compared to most other countries. Despite all this professional development, student performance has not improved since 2002, so why should we believe that further money spent on teacher training will make any difference? To put these astonishing sums of money into perspective, the Government will spend just $40m on rolling out the brand new Digital Technologies curriculum, including $24m on teacher training. This is an area in which teachers will have very little experience, especially programming. There is a much cheaper and effective form of professional development. Roll out my recent presentation to members of the New Zealand Educational Institute (NZEI Te Riu Roa) nationwide, and then see the maths that our kids can do. ← Have New Zealand’s PISA rankings really improved? I did the same analysis of the same TIMSS test and agree with you. We need to address these obvious gaps in our students’ knowledge and the sooner the better. It seems quite remarkable that so few teachers are willing to acknowledge the problem and do something about it.